HERO ARTEFACT: PŪTORINO - A very old Pūtorino that is thought to predate European arrival to Aotearoa. Pūtōrino are unique to Māori. In Māori whakapapa, all of the Māori flutes come from Hine Raukatauri, the daughter of Tānemahuta, the atua (spiritual entity) of the forest and birds. Hine Raukatauri is best known as the atua of flute music. She loved her flute so much that she chose to live inside it. She is now personified as the casemoth that hangs from branches of trees in a long slender cocoon. This casemoth cocoon is where the pūtōrino gets its shape from. Pūtōrino can vary dramatically in length, the shortest museum examples are around 220mm and the longest just over 650mm. 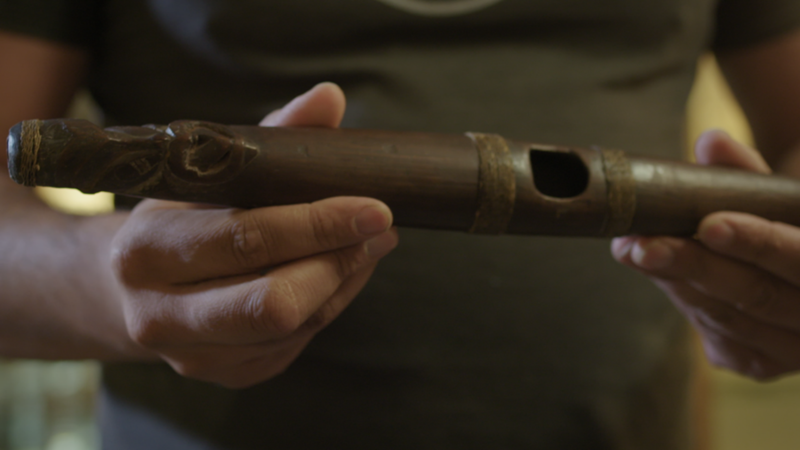 Pūtōrino are unique musical instruments as they can produce several voices. The main two voices are seen as male and female. The kōkiri o te tāne (male voice) is played like a trumpet, producing a unique wailing sound that is varied in both volume and pitch by the playing pressure and hand movement over the māngai. The waiata o te hine (female voice) is played with a cross blown technique to produce a flute like tone that varies in pitch and volume according to the players embouchure and the volume of air being blown. Because of the variety of sizes pūtōrino come in and the variety of their voices, they are a highly valued and unique taonga to Māori.